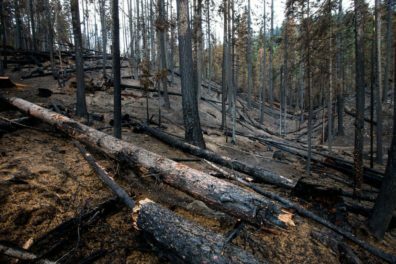 Washington wildfires disrupt water quality: Are drinking water systems resilient to climate change? Many fire-prone forested watersheds provide water for downstream communities. Climate change has influenced an increase in wildfire activity in Washington State, western North America, and other regions globally. Wildfires can influence both water quantity and quality from a watershed, and water providers must confront the challenge of adapting to a dramatically altered landscape and disrupted water supply. Currently, there are few post-fire source water quality data available for Washington State water suppliers. Such information is essential to support decision-making and effective management of post-fire threats to drinking water quality. Our goal in this project is to quantify and characterize the water quality and treatment concerns following the 2017 wildfire season in Washington. The Norse Peak wildfire recently burned the eastern slope of the Central Washington Cascade Mountains, including 22,625 hectares of the Naches River watershed. The City of Yakima depends on the Naches River for their primary source of drinking water. Our approach is to partner with the City of Yakima Water/Irrigation Division to quantify the raw source water quality at the Naches River water intake, pre and post-fire. The watershed is characterized by steep slopes vulnerable to soil erosion, which will likely be enhanced following the fire. Spring runoff and flooding can cause high sediment concentrations or turbidity, which the existing Naches water treatment plant cannot effectively process. Post-fire runoff might also contain elevated natural organic matter (NOM) levels, which can react with chlorine to form toxic disinfection byproducts (DBPs). Water treatment plants must reduce NOM to meet DBP regulations under the Safe Drinking Water Act. The effects of the Norse Peak fire will likely heighten existing pressures on Yakima’s water system, including particle removal, solids processing, and DBP formation. This new (2018) project will use existing historical monitoring data to characterize pre-fire water quality for the water intake. In addition, we will conduct field-based sampling of the Naches River intake during the 2018 snowmelt and runoff season to supplement the frequency of the existing monitoring program and expand the type of measurements through more advanced analyses. Samples will be characterized for post-fire changes in turbidity, nutrients (N, P), NOM quantity and quality, and DBP precursors. Additionally, a bench-scale treatability study will be used to address process performance (i.e., conventional coagulation, direct filtration) challenges and finished water quality implications (i.e., DBP levels). Our work has the potential to engage stakeholders and researchers in hydrology, ecology, forestry, water quality, and engineering. We will provide Washington communities with a knowledge base and recommendations founded on science to prepare for degraded source water quality following a wildfire.